As you know, I just got my very first Cricut machine yesterday and love it. Here's a quick thank you card that I whipped up to send to my very thoughtful and generous auntie. 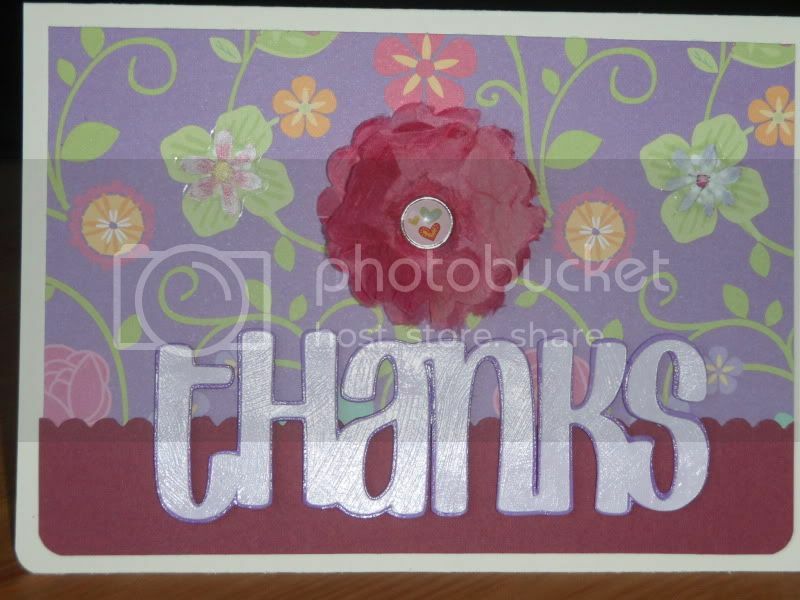 The "thanks" is cut using the Don Juan cartridge that came with my Cricut at 2 inches. It is matted on the same word shape cut using the "shadow" feature button. I glossed it up with some Modpodge and popped it up using foam tape. The heart brad is Basic Grey and the paper came in a magazine last year. The tissue paper is from Stampin Up (I know this because I got it from a friend who exclusively had Stampin Up stuff), but I have no idea what it's called. I punched two layers using a scallop punch and then sort of ruffled it to make it look more like a flower. A couple random stickers from my stash rounded it out. Hope she likes it. Sorry for the uncentered shot. Of the several pictures I took, this wound up being the only one that picked up the glossy sheen.